Whether you're planning a tropical-themed beach wedding, Caribbean wedding or simply an outdoors spring or summertime wedding, these tropical buri fans are guaranteed to keep your guests cool. Hand them out to guests before the ceremony or arrange them on the chairs. 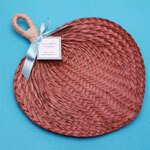 Made from natural woven straw these natural and coloured buri fans are light-weight and fresh. Use them as favours, place cards for your guests or simply as a lovely home decoration. (ribbon and tags not included). Measure approx. 8-10 inches in width. Please note each fan is hand dyed so colours and sizes may vary from one fan to another. Delivery lead time up to 2 weeks. This product is currently out of stock. Please contact us for further stock availability.